on the topic of setting goals…how appropriate, right?! my husband and i set goals for ourselves every year both individually, as a couple, and for our family. last year i tried to get our kids to set some goals but it just consisted of asking them what they wanted to accomplish this year and writing out a list…it was easily forgotten within a week. i think what i failed to teach them was WHY it is important for us to set goals :: so that we can improve ourselves, develop the talents our Heavenly Father has already blessed us with (and any more talents we want to have!) so that we can serve our Heavenly Father and our fellow men and return to live with Him one day through our efforts. the first packet is directed toward older kids and teenagers because it dives more into the Gospel Principles related to setting goals (think agency, work, and accountability), and how setting goals and self-improvement are part of the plan of salvation. 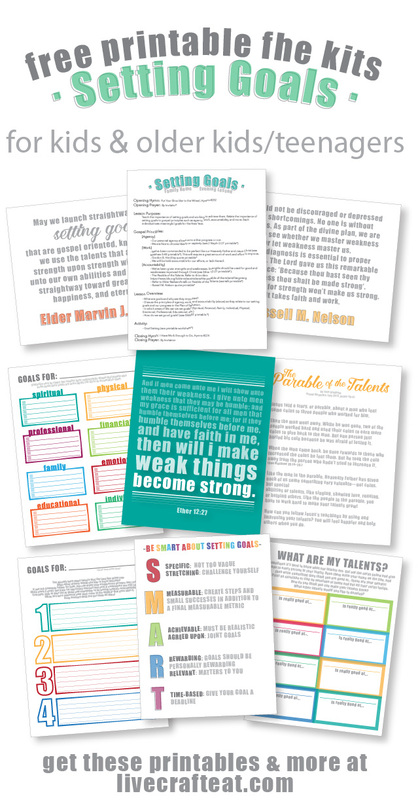 it includes a talk, printable scriptures and quotes, a goal-setting sheet with different areas to think about, and a guide on how to set good goals. the second packet is for younger kids and is much more simplified…because we all know how trying to keep their attention for more than 5 minutes can be a challenge! so their kit includes a scripture, a couple of short quotes, a little story of the parable of the talents, a simple goal-setting sheet, a guide to setting good goals, and an activity where the family writes down things that each person is good at on printable cards (and envelopes for keeping their cards) thus discovering their talents so they can be motivated to set goals to develop more! so no matter what age your kids are, you’re sure to find something that will help in teaching them not only how to set goals in the first place, but WHY it is important for each one of us, young or old(er) to set goals. don’t forget to do a delicious dessert as part of your goal setting family home evening lesson either! if you like this post and these printables, please feel free to share on facebook and pinterest! it’s a great thing to share so other people can learn how to help their families improve and grow. thank you for visiting my little blog, and have a happy goal-filled new year! 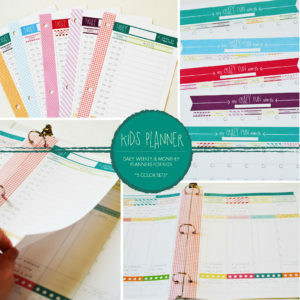 help your kids start their new year off right with these organizational daily, weekly, and monthly calendar sets for kids available in my etsy shop! with 5-star reviews, everyone who has used them say their kids love them! These are wonderful and so well thought out! Thanks!